Summerlin Las Vegas is home to more than 93,000 residents who live in more than 37,600 homes, townhouses, condominiums and apartments. Nearly 22,000 people work in Summerlin’s business parks, retail centers, schools and medical centers. Summerlin, Nevada community still has more than 7,500 of its 22,500 acres left to develop with completion scheduled for 2020. Of the 30 villages Summerlin Las Vegas will have at build-out, 11 are complete and eight are under active development. “The majority of Summerlin Las Vegas future real estate development will occur in the community’s southern and western regions,” Orrock said. “What many don’t realize is that Summerlin’s southern tip extends well beyond Russell Road and that its western boundary is formed by the Red Rock National Conservation Area that The Howard Hughes Corp. helped establish in the late 1980s via a real estate land exchange with the Bureau of Land Management. Summerlin, Nevada began as a 25,000-acre parcel purchased by the legendary Howard Robard Hughes Jr. in the mid-1950s along the western rim of the Las Vegas Valley. In the late 1980s, the community’s boundaries were further defined by the sale of land to other developers who went on to develop the adjacent communities of The Lakes, Peccole Ranch, Desert Shores and South Shores. A 1987 land exchange with the Bureau of Land Management (BLM) defined the community’s western boundaries before development began in earnest. Facilitated by The Nature Conservancy, the effort included an exchange of 5,000 Hughes-owned acres in environmentally sensitive areas for 3,000 BLM-owned acres inside the Las Vegas Valley. The Mesa Village encompasses 500 acres and features a desert contemporary architectural style. Currently, the community offers a dozen different floor plans built by KB Home and Richmond American Homes for sale in Summerlin. The homes in the first neighborhood of Ladera, range from 1,642 to 2,804 square feet and are priced from the mid-$300,000s to more than $550,000. Engle Homes will soon offer three additional floor plans in Ladera that will range from 2,027 to 2,574 square feet. The village’s 18-acre park is currently under construction and will feature a basketball court, tennis courts, a tot lot, several little league baseball fields, covered picnic armadas and a large play area. The Urban Land Institute, the nation’s leading real estate development organization, named Summerlin the 2002 New Community of the Year. Robert Charles Lesser & Co’s. independent surveys ranked Summerlin as the country’s best-selling master-planned community for much of the last decade. 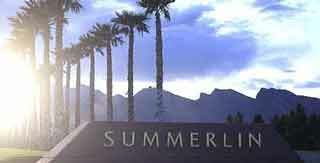 Situated along the western rim of the Las Vegas Valley, Summerlin is unfolding in villages. The community is home to more than 100 neighborhood and village parks, more than 120 completed miles of the Summerlin trail system, shopping centers, schools, shopping centers, cultural facilities, medical facilities, nearly 100 model homes and business parks. Summerlin homes are available in a variety of styles, from single-family homes, townhomes and condominiums. These Summerlin homes are prriced from the high $100,000s to more than $2 million. Call 702-505-6988 for VIP representation and purchase of your home for sale in Summerlin today. Summerlin Las Vegas master plan nears halfway point of its Summerlin real estate development.